Below are common attributes associated to Compacta Holly. Become a care taker for Compacta Holly! Below are member comments regarding how to plant Compacta Holly. No comments have been posted regarding how to plant Compacta Holly. Be the first! Do you know how to plant Compacta Holly? Below are member comments regarding how to prune Compacta Holly. 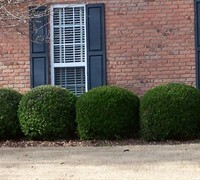 No comments have been posted regarding how to prune Compacta Holly. Be the first! Do you know how to prune Compacta Holly? Below are member comments regarding how to fertilize Compacta Holly. No comments have been posted regarding how to fertilize Compacta Holly. Be the first! Do you know how to fertlize and water Compacta Holly? Below are member comments regarding how to deal with Compacta Holly's pests and problems. No comments have been posted regarding how to deal with Compacta Holly's pests and problems. Be the first! Do you know how to deal with pests and problems with Compacta Holly? Get Compacta Holly fresh and large directly from the grower to your garden! Buy Compacta Holly online from the nursery wholesalers and save BIG! Plant Compacta holly in well-drained soil in either full sun or partial shade. Consistently wet soils can cause problems with the roots. Compacta holly is a low maintenance plant that requires no pruning however can be sheared to various formal shapes or into a formal hedge. Compacta holly prefer an acid soil with a pH in the range of 5 to 7. I fertilize hollies in spring and again in late summer with a well-balanced shrub & tree type fertilizer that includes a micronutrient package containing iron and/or sulfur. If the foliage on your holly develop chlorosis (yellowing of leaves), due to soil that is too alkaline, you can apply additional amounts of chelated iron and/or soil sulfur to lower soil pH, making it more acidic. Compacta holly is a very tough plant that has very few insect or disease problems. Consistently wet soil can cause serious problems with the roots. In the mid-Atlantic region, compacta is highly susceptible to black root rot, which can be dormant in the soil for years even without a host. I'm currently in the process of losing all of my newly planted shrubs along the front of the house. Where I'm at in mid Georgia, where we have clay-based soil, I've seen many varieities of Ilex crenata (Japanese holly) affected by root rot, especially in sites that drain slowly after rain or irrigation. I always recommend planting Japanese Holly in raised beds or mounds to keep the roiots above the water table. If any Japanese holly dies from root rot I would always recommend replacing with another species of holly, such as dwarf yaupon (Ilex vomitoria), or some other type of plant.